“The bus was leaning a little bit,” Philip Hurd told CBS-11 on Thursday, after he and nearly four dozen others had reached the safety of the downtown Dallas Greyhound terminal. Only the driver seemed unconcerned by her driving, passengers told the station. As the bus sped and wobbled toward Dallas, McClellan said, politeness eventually had to go out the window. Instead of pulling over, McClellan said, the driver tried to ward off sleep by jabbing herself in the face with a pair of tweezers. Finally, what CBS called a “mutiny” took place on the Greyhound. It was partially captured on video. Still not willing to pull over, passengers told CBS that the driver stood up while the bus was still moving to argue with the man. “So get off the bus,” she said in the video. “I bet I don’t,” the man said. The man then turned around and asked the other passengers who – he or the driver – was doing too much at that moment. “She is!” a chorus replied. The spokeswoman added that Greyhound has opened an internal investigation into the allegations and temporarily grounded the driver, who eventually relinquished control of the bus. Passengers told CBS-11 that Border Patrol agents finally escorted the bus off the road, where Greyhound found someone else to drive them to Dallas – several hours late but safe. The company shuttles millions of passengers between cities each year and has faced accusations like this before. A CNN investigation in 2016 reported a long list of horror stories, including a bus “fishtailing for miles,” a driver with red eyes, and a driver asleep at the wheel. A government study once found that more than a third of passenger-bus crashes were blamed on driver fatigue, the network reported. While Greyhound reports top safety ratings from the Transportation Department, CNN accused the company of failing to enforce rules requiring drivers to take a break every 150 miles. 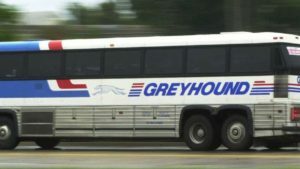 Greyhound had no response to the 2016 allegations, according to the network, except to say its safety record was excellent.